A physical uplink is used by virtual servers to communicate with the virtual and physical servers that are hosted outside of their virtual switch. This path must be guaranteed to be redundant and reliable at all times. 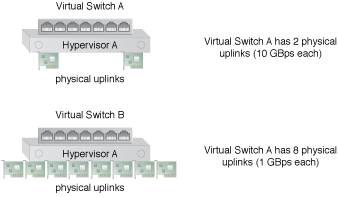 If more than one physical NIC is attached to the virtual switch, a redundant physical connection can be added to increase path availability. Bandwidth is another important parameter. When a virtual switch is used to connect to multiple virtual servers, the outgoing traffic to any physical and virtual servers that are not connected to the same virtual switch needs to pass through the physical uplinks. The bandwidth and capacity of the physical uplinks (NICs) are shared between all of the virtual servers that are attached to the same virtual switch. Physical NICs that are attached to a virtual server can become bottlenecks whenever demand and traffic increase. Issues like delays, performance degradation, packet loss and SLA breaches can result. If two or more physical NICs are attached to a virtual switch, the aggregate capacity of multiple NICs can be leveraged into a larger uplink by using load-balanced virtual switches. Selecting the correct type of physical uplink is critical since physical servers have a limited number of ports for additional network cards. In Figure 1, Virtual Switch A has 2 physical uplinks whose bandwidth is 10 GBps each. Virtual Switch B has 8 physical uplinks whose bandwidth is 1 GBps each. Virtual Switch B is using more uplink ports than Virtual Switch A. How many physical NICs need to be attached to each virtual switch? Can other mechanisms be used to overcome this limitation? Since virtual switches use the NICs installed on the host to connect to the outside, the host may require the NICs for other methods of communication. However, the performance of the NICs may be inadequate for some of these methods of communication. This means that other solutions may need to be developed to provide the applications and cloud services with the networking features that they require.